In the heart of the Hautes-Alpes is the sunlit lake Serre Ponçon. The lake covers an area of 3000 ha and is the largest reservoir in Europe. 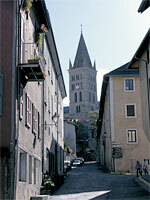 The dam (built from 1955 to 1961) , where the rivers Durance and Ubaye come together, is 124 m high and 630 m wide. The lake is ideal for surfers and sailors and for young families there is a "plan d'eau".This is a separate bathing area with a specially costructed fine gravel beach, playground and a large lawn.An ideal place for chidren! The pool, miniature golf course and tennis courts can be found here. 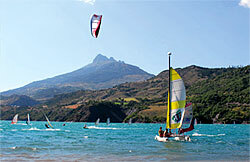 The lac Serre - Ponçon can be reached at 10 minutes walk from the campsite. 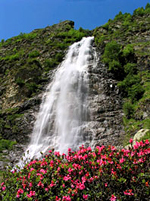 The Parc National des Ecrins is one of the largest and most beautiful natural parks in the French Alps, with many three thousand meters high peaks. 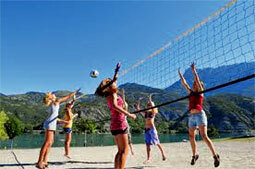 Each season has its own charm and you can enjoy the diversity of the landscapes. Embrun is at 870 meters altitude and is a small town between Gap and Briançon.Embrun has about 7000 inhabitants, and is near the largest reservoir in Europe - the Lac de Serre-Ponçon. 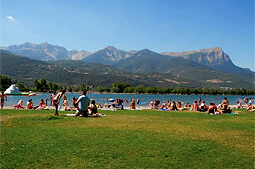 Embrun is only 5 minutes walk from the campsite.